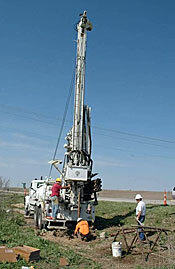 The Eastern Nebraska Water Resources Assessment (ENWRA) project was formed in 2006. The sponsors consist of six NRDs (Lewis and Clark, Lower Elkhorn, Papio-Missouri River, Lower Platte North, Lower Platte South, and Nemaha) formally organized by an Interlocal Cooperative Agreement. Other cooperating agencies include the: Nebraska Department of Natural Resources, Conservation and Survey Division, School of Natural Resources, University of Nebraska-Lincoln; and U.S. Geological Survey. The long-term goal of the project is to develop a geologic framework and water budget for the previously glaciated portion of eastern Nebraska. The initial funding source was a three year Interrelated Water Management Plan/Program (IWMPP) grant. At the inception of the ENWRA project, the technical advisors and sponsors were uncertain how to characterize the geologically complex glaciated portion of Nebraska. The team decided on a pilot study approach to the first three years of the study, in which various technologies were applied to three geologically distinct study sites to determine the most efficient way to characterize eastern Nebraska’s varied geology. 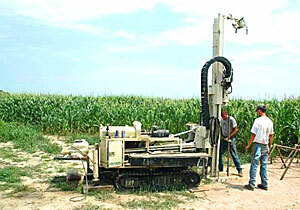 Several tools and techniques were applied, including: non-invasive geophysical techniques such as Helicopter Electromagnetic (HEM), ground Time Domain Electromagnetic (TDEM), and passive seismic surveys; and subsurface investigations including heat dissipation probes, soil moisture probes, test holes, monitoring wells, and pressure transducers. HEM survey (frequency domain electromagnetic geophysical method) was found to provide useful information in two of our three pilot study sites where there was little to moderate thicknesses of glacial till. The ground TDEM results were consistent with the test hole drilling, but did not provide the resolution of the HEM data sets. Passive seismic surveys did not provide a confident pick of the bedrock surface due to the low velocity contrast and the gradational change in the velocity structure. Heat dissipation probes, soil moisture probes, test holes, monitoring wells, and pressure transducers, although not useful for large-scale characterizations, are deemed critical for better understanding local aquifers. 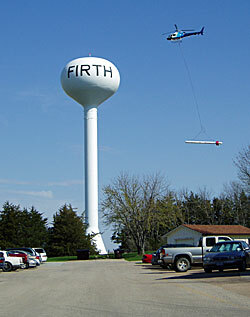 As a result of the early pilot study work, Lower Platte South and Lower Platte North budgeted money to conduct additional HEM surveys in their districts in 2009. The North Platte NRD also funded the collection of HEM data in their district in 2008. As part of its Year 3 budget, ENWRA provided funds for the U.S. Geological Survey (USGS) to further study geophysical tools that may be useful in areas where saturated sand and gravel units are buried by thick sequences of glacial till. Building on the results presented within the USGS study report (Scientific Investigations Report 2011-5228 available on the Media/Downloads page), current studies have shown further successes using TDEM in airborne electromagnetic surveys (AEM). The Lower Elkhorn and Lower Platte South contracted with XRI Geophysics, LLC for approximately 150 square miles (Clarkson-Howells and Dwight-Valparaiso-Brainard areas) of AEM surveys using TDEM in 2013. The recent flight results have shown that well-calibrated TDEM AEM survey methods allow for large-scale, non-invasive characterization in areas where glacial till is thick and the aquifers are deeply buried. The ENWRA project understands, with this recent proven AEM technology and study work to date, that it has identified the minimum number of tools needed to characterize the geologic framework for eastern Nebraska. The ENWRA project is a progressive step forward in the way we approach groundwater management in eastern Nebraska. It offers an opportunity to stay ahead of potential future problems by joining together and pooling resources. We hope to avoid the pitfalls of overdevelopment and improper management as well as provide lasting benefits to our mutual economic, environmental, and social interests in this region.